The aim of this study was to compare the outcome of tissue expansion between adults and children. Postburn alopecia of the scalp is a huge surgical challenge. In 1957, Charles Neuman first described the use of gradual tension, leading to the expansion of skin by an inflatable balloon, buried subcutaneously above the ear. In 1975, both Radovan and Austad's group began working on soft-tissue expansion. This study included 40 patients divided into two groups – group A included 20 children aged 5–12 years, and group B included 20 adults aged 16–29 years. All patients suffered from postburn scalp alopecia, reconstructed using tissue expanders, with volume capacity ranging from 100 to 550 ml. Infection occurred in four adults and 10 children, exposed expander was found in three adults and eight children, exposed valve line was found in three adults and three children, and ischemia of the flap in one child. Using tissue expanders is a reliable and safe method for reconstructing postburn alopecia with a very good outcome in adult patients compared with young children. 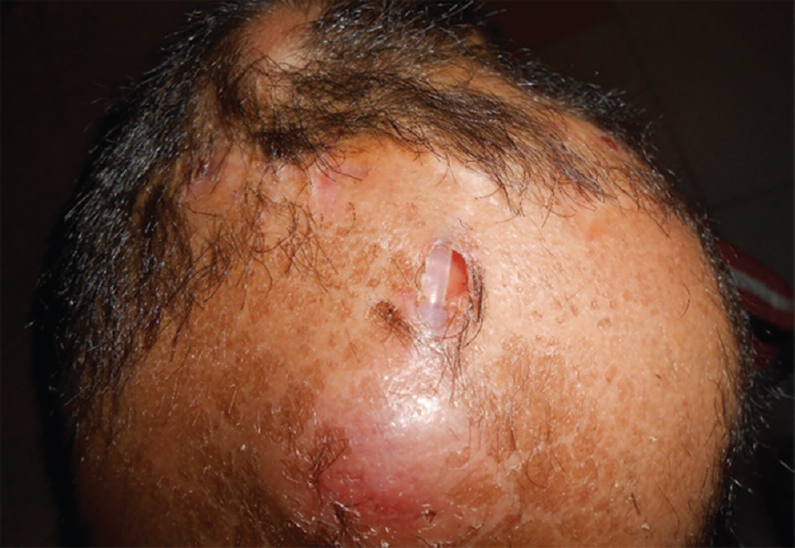 Scarring alopecia or cicatricial alopecia results from a follicular damage that is sufficient to produce destruction and replacement of the pilosebaceous structures by the scar fibrous tissue. Burn is an exogenous factor that causes secondary scarring alopecia . Many techniques have been used for treating alopecia surgically, such as scalp reduction, hair grafting, the use of local flaps, and the use of tissue expanders . Tissue expansion is an important tool for providing donor skin that is an optimal match in terms of skin color, texture, and hair-bearing characteristics . This occurs by implanting a sac subcutaneously, and by regularly injecting normal saline into it new skin forms under the mechanical stretch, providing a supply of tissue similar in color, structure, and distribution to the lost tissues for defect repair . There are factors to consider when planning a tissue expansion strategy: the dimensions of tissue to be replaced, proper expander selection, incision type and placement for expander insertion, the number of expanders to be used, and the schedule for saline injections. Careful planning is necessary to obtain excellent results . Tissue expanders come in all shapes and sizes. Several investigators have recommended the use of expanders with a base width that is 2.5–3 times the width of the defect to be covered. Injection of 10% of the volume per week is required to complete expansion within a 3-month period . Once the expander has been successfully inflated and ready for removal, advancement or rotation of the flap is decided. The best method for maximizing the use of expanded tissue in both vertical and horizontal directions is by scoring the capsule to increase flap advancement. Measuring the dome of the expander and subtracting the width of the expander is fairly accurate in determining the amount of flap advancement . All expanders nowadays have a remote valve. The greatest advantage of the remote valve and filling tube is to keep the injection point well away from the balloon, thereby avoiding any risks of balloon puncture while inflating the expander. Remote placement allows positioning at a place under the skin where it can be easily palpated . Tissue expansion is a long, multistage process that requires careful planning; therefore, it is likely that some complications and unfavorable results occur during the course. Minor complications include issues related to hematomas and seromas, valve placement or location, exposure of the valve alone, and inadequacy of the expansion related to the defect/lesion. Major complications include cellulitis and closed infections, exposure of the expander balloon itself, deflation of the balloon, and ischemic necrosis of the overlying skin . The aim of this study was to compare the rate of complications of tissue expansion in scalps between adults and children. This study was carried out at Menoufia University hospitals and Nasr City Insurance Hospital from April 2014 to July 2015. This study included 40 patients who were divided into two groups – group A included 20 children aged 5–12 years and group B included 20 adults aged 16–29 years. 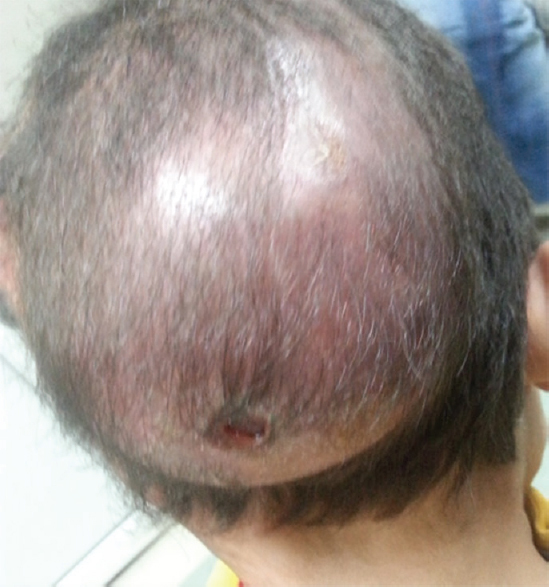 All patients suffered from postburn scalp alopecia. A detailed history was obtained from all patients. A careful medical examination was carried out for all patients regarding donor site and area of alopecia; tissue expansion was performed for all cases using saline-filled tissue expanders with variable volumes. The study was approved by the Ethics Committee of Menoufia Faculty of Medicine, and informed consent was obtained from each patient or the guardian of each patient. Following general anesthesia, broad-spectrum intravenous antibiotics were administered to all patients. Rectangular, smooth-surface, silicone tissue expanders were used with volumes varying from 100 to 550 ml, and were preoperatively prepared according to the size of the defect. Patient positioning: patients were placed in either the supine position or in a position according tothe site of alopecia to be reconstructed (frontal, temporal, or occipital). Disinfection: the operative field was disinfected with povidone–iodine, and toweled in a normal manner. Step 1: the incision was made adjacent to the lesion where it would be the leading edge of the advancement flap or it could even be within the lesion. The incision should be perpendicular to the expander to lessen the risk of wound dehiscence, and of 3–5 cm length for dissection of a reasonably large pocket. Step 2: the pocket is dissected bluntly, using smooth-ended scissors in a subcutaneous plane. We created a narrow tunnel for the valve, after ensuring good hemostasis. The plane of the dissection is usually the relatively avascular subgaleal plane [Figure 1]. Figure 1: Dissection of the subgaleal pocket. Step 3: the expander was removed out of its sterile packaging. It was carefully examined for integrity of the envelope; any folds were stretched out gently, and the joint of the balloon with the tubing and the tubing with the valve were carefully inspected. A method to ensure integrity is to fully immerse the expander, tubing, and valve in a bowl of normal saline and gently squeeze it to examine the presence of any escaping air bubbles. Once it is confirmed that there is no leakage, the excess air within the expander is removed by using a vein needle inserted into the valve dome. Step 4: the device was positioned after removing air, and the valve was pushed into its tunnel. If there was any possibility of migration from its tunnel, it was fixed with sutures. The system was tested by injecting 30 ml of saline through the valve [Figure 2]. Figure 2: Introduction of the expander to the subgaleal pocket. Step 5: the incision was closed using silk or vicryl 3–0 over a suction drainage system that was removed within 24 h before discharging the patient. Patients were prescribed prophylactic antibiotic therapy for 5 days. Skin sutures were removed after 10 days once good primary healing had occurred. Serial expansion was started 2 weeks after insertion, provided that the skin flaps were in good condition. The injection must not be painful, and the skin should not be discolored. We stopped filling when patients felt a stretching sensation, because skin expansions are usually comfortable. If there was any sign of hyperpressure, we removed some liquid. The filling process was continued at a rate of one or two sessions per week until enough soft tissue was obtained [Figure 3]. Figure 3: A male patient (a) after expander implantation; (b) during the process of expansion; (c) after reaching desirable flap size; and (d) after covering the defect with expanded skin flap. After cleaning the expander placement area and valve placement area as for any aseptic procedure, the valve area was carefully palpated once again, and a vein needle was pierced through the skin perpendicularly into the dome of the injection valve. Using a 10 cm 3 syringe, gentle aspiration was first performed to ensure continuity of the system and smooth return of saline from the expander; next, further expansion of the balloon was performed with normal saline. A chart was maintained, which recorded the expander size/volume and shape inserted, the location of placement on the body, amount of saline filled intraoperatively, and any special features encountered during placement. Patient tolerance and any pain and discomfort such as feeling very tight signaled the end of expansion for that session. All these factors were balanced, and fluid was added or withdrawn toward the end of expansion in each session. The scalp vein needle was removed, and the prick point was kept under pressure for a minute until any point bleeding stopped. The point was dabbed with antiseptic ointment and covered with a sterile gauze piece or a band-aid for 24 h.
The total volume achieved at each session was recorded in the expansion chart with remarks about problems seen or local signs encountered at each session. Step 5: a suction drain is placed and removed after 24–48 h. Skin closure was performed. Postoperativley, very light dressing was applied to avoid impairment of flap vascularity. Prophylactic antibiotics and analgesics were administered for 5 days. The sutures were removed 8–10 days postoperatively. 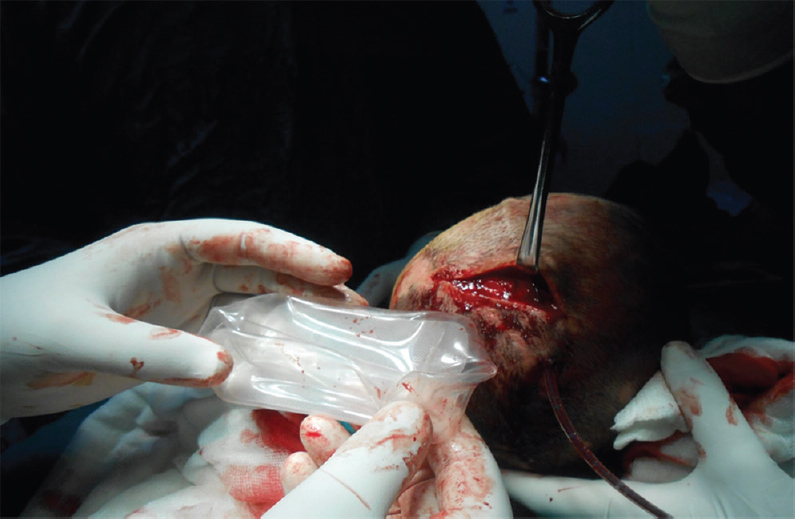 The patients were followed-up at the outpatient clinic: patients were seen several times in the clinic for assessing flap viability, any signs of infection, hematoma or seroma, and hair growth in the new flap. The collected data were revised, coded, tabulated, and introduced to a PC using statistical package for social science (SPSS 15.0.1 for Windows, 2001; SPSS Inc, Chicago, Illinois). Data were presented and suitable analyses were carried out according to the type of data obtained for each parameter. Frequencies and percentages were used for non-numerical data. Fisher's exact test was used to examine the relationship between two qualitative variables when the expected count was less than 5 in more than 20% of cells. This prospective study was conducted as a joint venture by the Department of Plastic Surgery at Menoufia University Hospital and Nasr City Insurance Hospital from 2014 to 2015. This study included 40 patients who were divided into two groups – group A included 20 children aged 5–12 years, and group B included 20 adults aged 16–29 years (25 males and 15 females), as shown in [Table 1]. All patients suffered from postburn alopecia, reconstructed using tissue expanders, with volume capacity ranging from 100 to 550 ml, as shown in [Table 2]. The present study aimed to compare adults and children regarding postoperative outcome. Infection was present in four (20%) adults and 10 (50%) children, exposed expander was observed in three (15%) adults and eight (40%) children, exposed valve line in three (15%) adults and three (15%) children, and ischemia of the flap in one (5%) child, as shown in [Table 3] and [Figure 4] and [Figure 5]. Figure 4: Postoperative expander valve exposure. Figure 5: Postoperative exposed expander. Complications increased in children with a percentage of 55% against 30% in the adult group, as shown in [Table 4]. Burn duration, area of alopecia, fluid volume, and expander size were statistically nonsignificant in group A showing early postoperative removal compared with group B, as shown in [Table 5]. The adult group showed better recovery than children, as shown in [Table 6]. Skin expansion is one of the major developments in reconstructive surgery. The use of tissue expansion has been popularized among plastic surgeons, and has become the treatment method of choice for many congenital and acquired defects in a wide variety of diseases . It is believed that an alopecia area involving 50% or more of the total scalp surface can be repaired using multistage or serial tissue expansion . It is important that tissue at the donor site is of good quality, well-vascularised, and free of any bacterial infection. Selecting the expander is related to the size of the defect, the available donor site, and expected advancement of a hemispherical domed flap. There is an end point indication of expansion at any session as local pain, blanching, and high tissue tension. Thin skin in elderly patients or children should be expanded more carefully . In this study, postburn alopecia patients were selected for analyzing postoperative complications. The total surface area of alopecia in the child group (group A) ranged from 20 to 150 cm 2 compared with 20 to 80 cm 2 in the adult group (group B). Although the total surface area of alopecia in children seems larger compared with adults, it is statistically insignificant. In this study, in group A, there was infection in 10 (50%) cases, with expander exposure in eight (40%) patients, exposed valve line in three (15%) patients, and ischemia of flap in one (5%) patient. Some patients had more than one complication at the same time, resulting in failure of eight (40%) cases. In the adult group (group B), complications were present in only 30% of the cases where four (20%) patients developed infection, three (15%) patients developed exposed expander, and three (15%) patients had exposure of their valve lines. None of the patients had ischemia of the flap (0%), resulting in failure of only four (20%) cases. Therefore, in this study, infection was the most common complication resulting in expander exposure; recovery was bad in these patients and better in those with valve line exposure. The time of expander removal varied from 3 to 12 weeks after implantation according to the presence of complications, as severe infection with expander exposure caused rather early removal. Owing to the increased infection rate in children, they underwent earlier expander removal compared with the adult group with statistical significance (P = 0.03). Two cases, one from the children group and one from the adult group, showed inflamed skin over the implanted valve. The injection was postponed, and anti-inflammatory measures were taken; both conditions improved. Previous studies have shown that the valve may be exposed from pressure necrosis. This may be due to the fact that often the valve is placed subcutaneously. To avoid this, the valve has to be completely exteriorized . The best method for maximizing the use of expanded tissue in both vertical and horizontal directions is by scoring the capsule to increase flap advancement . Cunha et al. reported a 10-year experience with tissue expanders. The complication rate was 22.2%, and the most common causes were expander exposure (50%), infection (24%), and bad function of the expander (12.8%). Their study revealed an increased rate of minor complications in children aged 0–10 years compared with patients aged 11–20 years or patients older than 40 years. Friedman et al. reported a 6-year experience with tissue expanders in children. The overall complication rate was 18%. The factors associated with a statistically significant increase in complications were burns and soft-tissue loss, patient age under 7 years, use of internal expander ports, and a history of two or more previous expansions. The results of these two studies are in agreement with this study: complications occurred more in children than in adults. The results of this study showed 55% complication in group A compared with 30% in the adults group (group B) and an increased failure rate in children (50%) than in adults (20%), with a statistically significant difference (P = 0.4). Using tissue expanders is a reliable and safe method for reconstructing postburn alopecia with a very good outcome in adults rather than young children. It provides better results when performed after the age of 15 with minimal complications caused by infection and decrease in failure rates. Special care for scalp hygiene and early preoperative scalp shaving during preparation of patients are recommended to decrease the level of infection. Inalöz HS, Chowdhury MM, Motley RJ. Lupus erythematosus/lichen planus overlap syndrome with scarring alopecia. J Eur Acad Dermatol Venereol 2001; 15:171–174. Hassan AS. 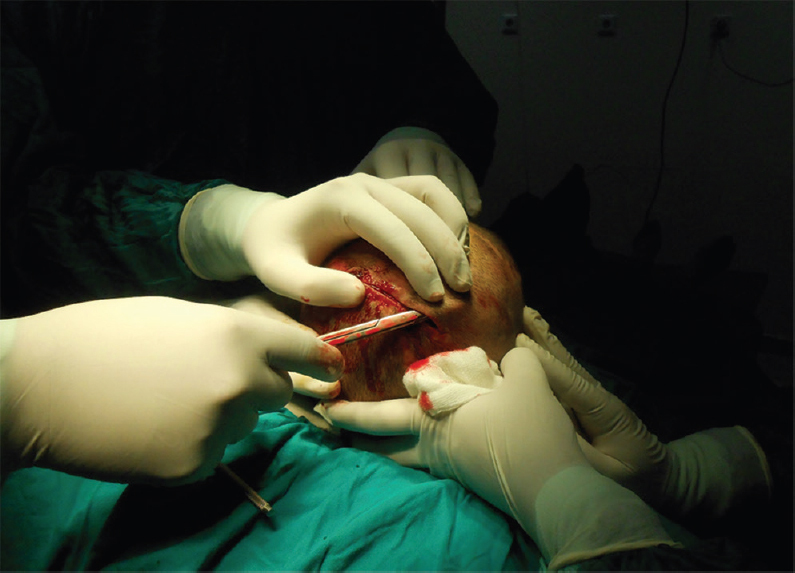 Surgical treatment of secondary cicatricial alopecia of scalp and eyebrow. Indian J Plast Surg 2009; 42:63–67. Yeşilada AK, Akçal A, Tatlıdede HS. The feasibility of tissue expansion in reconstruction of congenital and acquired deformities of pediatric patients. Int J Burns Trauma 2013; 3:144–150. McCauley RL. Hair restoration, state of the art, tissue expansion reconstruction of the scalp. Semin Plast Surg. 2005; 19: 143–152. Hudson DA Maximizing the use of expanded flaps. Br J Plast Surg 2003; 56:784–790. Wagh MS, Dixit V. Tissue expansion reconstruction of the scalp. Indian J Plast Surg 2013; 46:333–348. Gürlek A, Alaybeyoğlu N, Demir CY, Aydoğan H, Bilen BT, Oztürk A. 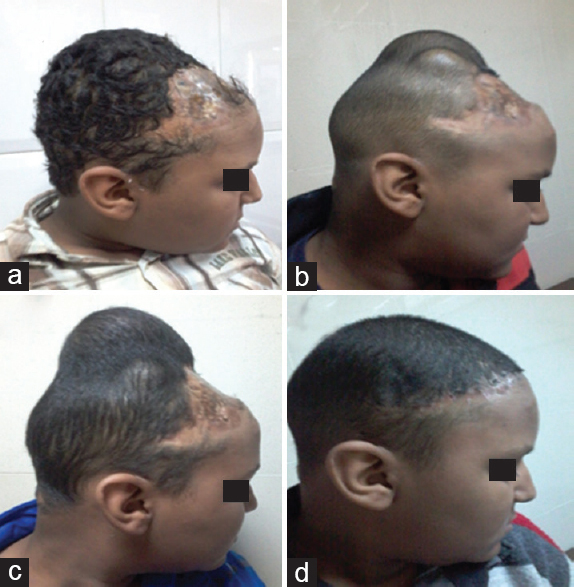 Aesthetic reconstruction of large scalp defects by sequential tissue expansion without interval. Aesthetic Plast Surg 2004; 28:245–250. Keskin M, Kelly CP, Yavuzer R, Miyawaki T, Jackson IT. External filling ports in tissue expansion: confirming their safety and convenience. Plast Reconstr Surg 2006; 117:1543–1551. Cunha MS, Nakamoto HA, Herson MR, Faes JC, Gemperli R, Ferreira MC. Tissue expander complications in plastic surgery: a 10-year experience. Rev Hosp Clin Fac Med São Paulo 2002; 57:93–97. Friedman RM, Ingram AE, Rohrich RJ. Risk factors for complications in pediatric tissue expansion. Plast Reconstr Surg 1996; 98:1242.